Great work posted on your site. We are really looking forward to getting our wedding's welcome board sketch done by you. 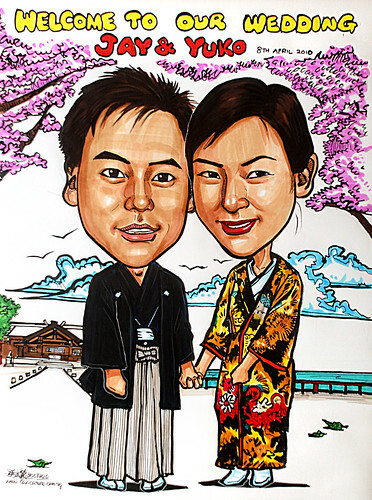 - Full body with the traditional japanese wedding kimono's (Stated as groom's and bride's kimono design) as attached in the picture. I have included our full body picture stated as Full body reference for your reference but pls note that, that attire is not the wedding kimono design. - We would like to be drawn standing on the squarish platform which is over calm water with the extended walkway that leads to the left as highlighted on the bottom of the attached "TOGO garden" picture to connect to the rear part of the drawing of the shrine as seen on the attached "Shrine" picture. - We would also like the bigger highlighted sakura blossom (as seen in "TOGO garden" picture) to be drawn above our heads with these words on it which has to be big enough to be read for our wedding reception board. The words are, " Welcome to our Wedding. Thanks for the input! and we are totally ok with doing it in portrait format, any further professional advice is totally welcomed. Will we have to forgo the sakura drawing even in portrait format or will there be enough space? The words can be written over the sakura if there isn't enough space or do you have any alternative suggestions as to how we can add in the sakura and words? I have attached scanned images for the TOGO garden however they are in 2 pieces, hope that's ok. And I could only get a picture of the shrine in the day without the red carpet, hope you could draw the shrine in the day with the red carpet. Lastly, it seems like the picture frame of 400mm X 300mm includes the border of the frame. Can the drawings be done in such a way that it doesn't get blocked by the flowers on the edges as well please. Thanks a million for listening to our endless requests." The kimonos were the most time-consuming, especially the bride's one. You can tell from the textile pattern. "Oh, Very nice!... beautiful! It's going to be a very good memory for us!"